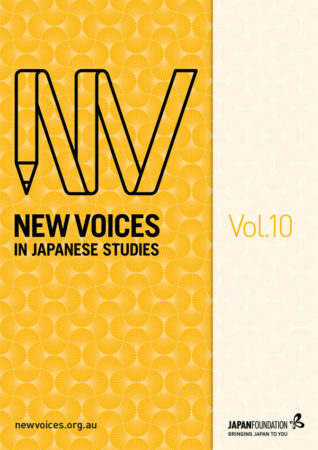 This volume of New Voices in Japanese Studies marks the tenth iteration of the journal since it was first published in December 2006 under the direction of Series Editors Wakao Koike and David Boyd of The Japan Foundation, Sydney; Guest Editor Dr Yuji Sone; and an Editorial Advisory Board of esteemed scholars in Japanese Studies across Australia and New Zealand. Each subsequent volume of the journal has been realised thanks to the efforts of many devoted individuals whose vision to support experience in the publishing arena among emerging Japanese Studies scholars has both contributed to the invigoration of new scholarship on Japan in the region and worked to encourage many contributors to further their postgraduate studies and establish careers in the field. The four papers in this volume are broadly linked by themes associated with identity construction and perception. Laying the groundwork for meaningful and original contributions, Shannon Whiley’s research draws substantially from Australian archival materials, while the papers by Monica Flint, Kelvin Lee and Daniel Flis share rigorous engagement with Japanese-language primary source materials. Situated in fields as diverse as military studies, political studies, linguistics and comparative literature studies, their topics are both historical and contemporary, ranging from examinations of national belonging, racial marginalisation and wartime experience to investigations into the construction of anime character traits and the production of gendered language and visuals in Japanese popular culture texts. This diversity in content not only highlights the dynamism that characterises local scholarship on Japan, but also underscores the value in producing a specialist journal dedicated to introducing the rich array of postgraduate and early career scholarship emerging in Australia and New Zealand to a broader audience. attitudes associated with the White Australia Policy, the ambiguity of enlistment guidelines, the threat of internment and the camaraderie they shared with their fellow soldiers. The sociopolitical significance of the paper is brought sharply into focus with an insightful analysis on the dissonances that emerged in the ways that Takasuka, Suzuki and Ide were viewed and treated by the Australian government and their communities, and how they perceived themselves. Monica Flint also addresses issues of identity and belonging to investigate the ways in which Okinawan Governor Takeshi Onaga has shaped the ongoing debate about the presence of US military bases in the prefecture. As Flint argues, since assuming office in December 2014, Onaga has marshalled attention towards heightened regional tensions between Japan and its neighbours and the relevance of the US-Japan Security Alliance to advance essentialist notions of Okinawan cultural identity, ethnicity and history. The paper demonstrates how Onaga has been able to garner support for his electoral mandate by carving out a point of difference with his predecessors through his focus on local identity over political ideology and his widespread use of social media platforms Twitter and YouTube. By analysing Onaga’s online presence, Flint sheds light on the ways he has used these new forms of communication as tools to problematise Okinawa’s long-standing and entrenched political issues. Kelvin Lee adopts an innovative mixed-method approach in his paper to explore how telecinematic texts transfer and recontextualise real-world language use in order to convey character traits such as social standing, thoughts and beliefs, and to index shifts in presentational personae. Taking the 2012–13 science-fiction anime series From the New World (Shinsekai Yori) as a case study, Lee investigates the discursive construction of the non-human protagonist, Squealer, through an integration of corpus linguistic analysis and scene-based analysis that draws from sociolinguistic theory. The three corpora selected by Lee are comprised of dialogue from the series, and reveal how Squealer’s identity is constructed using shifts in social and tonal registers and various other linguistic devices. During the research process, Lee discovered a number of limitations with the software currently available to analyse Japanese-language corpora. He also shares these insights in the hope that they may aid in the development of future versions. Daniel Flis examines two shōnen (boys’) manga texts to investigate how visual and textual representations of gender can play out on the page in vastly different ways, even within the same genre. Specifically, the paper highlights how the two female authors of Noragami (2010–), known together as Adachitoka, have challenged the conventional gendered framework of shōnen texts. In resisting the stereotypes and power dynamics that typically characterise the heteronormative narratives of the genre, Noragami subverts such expectations as female characters occupying supporting roles and conforming to traditional ryōsai kenbo (‘good wife, wise mother’) behaviours. Through an insightful comparative analysis with the male-authored Akame ga Kill! (2010–2016)—which shares a number of other traits with Noragami—Flis demonstrates how Adachitoka have successfully presented new forms of gender performance that depart significantly from the shōnen framework but also manage to negotiate a degree of fidelity to the genre. As with previous volumes of New Voices in Japanese Studies, each paper submitted for consideration in Volume 10 underwent a rigorous peer-review process which was reliant on the goodwill of many individuals. I would like to express my deep gratitude to the many scholars who generously invested time in providing thoughtful and constructive feedback both to the authors of the papers in this volume, and to those whose submissions required more time and reflection than the demands of the publishing schedule could accommodate. To the contributors, I commend you on your diligence and perseverance in what may have seemed like endless rounds of feedback and corrections: you should be very proud of your papers. To those whose submissions did not make it to publication, I encourage you to continue working on your research for consideration in future volumes of the journal. Finally, I am humbled to have been offered the role of Guest Editor for this volume. I would like to extend my sincere thanks to The Japan Foundation, Sydney, and in particular to Director Yoshihiro Wada for this invaluable opportunity. I am also indebted to Series Editor Elicia O’Reilly, whose editorial, organisational and diplomatic skills are superlative. Elicia’s good humour and tenacity kept the production process moving forward, at times under difficult conditions. Heartfelt thanks also to Acting Series Editor Leah Sourris, who expertly and patiently guided Volume 10 through the initial stages while Elicia was on leave. The production of this volume was interspersed with a number of personal milestones for the editorial team—including a baby’s first steps (Elicia), the launch of a new career (Leah) and a wedding (Penny)—making it a particularly memorable project for each of us. We hope you will join us in celebrating the achievement of the journal’s first ten volumes, and we look forward to your ongoing support as New Voices in Japanese Studies continues in its endeavour to provide a platform for new generations of scholars in Japanese Studies across Australia, New Zealand and beyond.